Far from its traditional image as the publisher of leisure maps for ramblers and cyclists exploring idyllic countryside, where the only disturbance is the rustle of a cagoule or the whirr of a freewheel, the Ordnance Survey’s origins are associated with preparation for war and it played a major role in the mapping of the First World War battlefields. In 1791, when it looked as though the chaos of revolution might travel across the water from France, the Government of William Pitt the Younger asked the Board of Ordnance – the Ministry of Defence of Georgian Britain – to survey and map the Channel coast of Southern England in preparation for invasion. Even though cutting-edge digital products for business now make up around 93% of its revenue, Ordnance Survey is justly famous for its iconic range of paper maps – maps like the familiar pink-covered Landranger Map series we all take for granted. Ordnance Survey, however, has a surprising history because, as Britain’s national mapping authority, today’s suppliers of business intelligence were originally charged with gathering military intelligence. Although the Survey has its roots firmly in the military, perhaps its biggest war-time challenge occurred as the business it is known for now started to emerge. Set against the backdrop of new civilian responsibilities – producing maps for land valuation and tax purposes – and the Edwardian love of exploration fuelling the growth in sales of leisure maps- the First World War saw the Survey embark upon an urgent military task of heroic proportions. With existing maps of France found inaccurate and unreliable, it re-mapped around 6,000 square miles of the Western Front. Ordnance Survey was already prepared for war at its outbreak, but the War Office initially stood the Ordnance Survey staff down, possibly because the prevailing attitude was that the war would be quick ‘all over by Christmas’, as the saying went. A fast, campaign that overcame resistance quickly could use existing, less detailed mapping, such as the small-scale 1:80 000 maps produced by Ordnance Survey’s French counterparts. However it soon became apparent that these would not suffice. Like most Herculean exercises of its kind, the survey of the Western Front didn’t always go to plan. 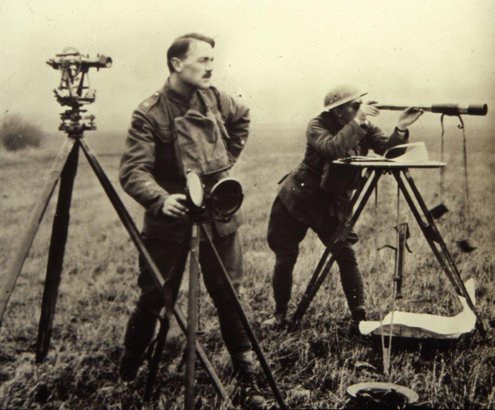 In late January, 1915, somewhere on the front lines between Béthune and Ypres the first surveyor sent out into the field was arrested as a spy on the grounds that no-one except a German would be likely to use a surveying instrument such as a theodolite in the area. 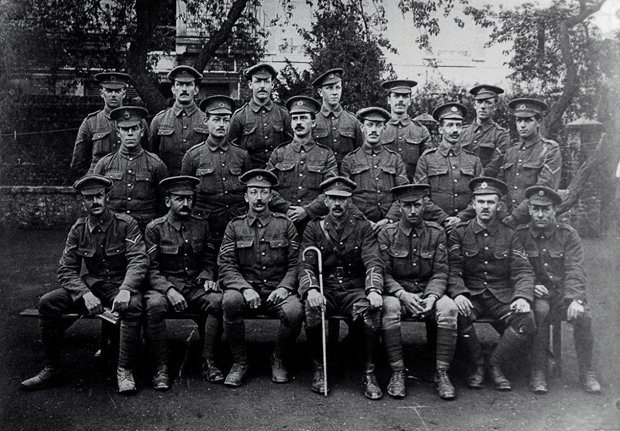 He was quickly released and allowed to continue, but the story – as told by Captain Winterbotham of the 1st Ranging Section of the Royal Engineers – underlines what must have seemed a curious sight to the average soldier at the time. Winterbotham himself was no stranger to attracting attention and became something of a celebrity by being able to direct artillery fire accurately onto unseen German positions – a feat which earned him the nickname of ‘the astrologer’. Mapping the front line in danger! Working near the front lines, the Ordnance Survey men routinely exposed themselves to danger – enemy (and occasionally ‘friendly’) fire, were common. As if the prospect of being shot wasn’t enough, the act of surveying itself was demanding and difficult and required the utmost care in an environment that changed so rapidly. A prominent building, like a church tower, that could be used as a landmark to anchor the map to a fixed point in the landscape, would often end up demolished by artillery. Worse still, a church tower might be re-erected fifty yards away from its original position, potentially throwing the accuracy of the map out enough to make a real difference to an operation or manoeuvre. Another difficulty of obtaining information about German trench and artillery positions was solved early on with the rapid development of aerial reconnaissance. These days, Ordnance Survey operate two aircraft solely devoted to aerial survey (they notch up around 80,000 km a year as part of the Survey’s ongoing work to update its digital mastermap of Britain), but in 1914, the technique was very much in its infancy and the photographs taken had to be corrected to match the projection of the map. Along with rapidly developing aerial reconnaissance techniques radio signals were used as beacons for the first time to synchronise sightings of observation planes over enemy positions - sophisticated calculations using both the sound and flash of enemy guns allowed German artillery to be plotted with high accuracy. A survey of captured ground after 1917’s Battle of Messines – an offensive that set the stage for the 3rd Battle of Ypres – found that 90% of German artillery positions had been accurately targeted. The military maps – around 33 million of them were printed – became more and more vital as the war wore on. Worries that ships carrying maps from Southampton might be sunk in the Channel led in 1917 to the formation of the Overseas Branch of the Ordnance Survey (OBOS), a unit of 103 men and 46 women based in an old factory near the Aire Canal at Wardreques in France. In one period of two weeks while Field Survey Companies were forced into retreat during the German offensive on the Somme in 1918, OBOS printed 300,000 maps. Sixty seven Ordnance Survey staff were killed during the war and they are commemorated at a memorial in a peaceful garden besides the new Ordnance Survey head office in Southampton. Without their sacrifice or the sacrifices of more fortunate colleagues, many more of their countrymen would have been killed or injured. 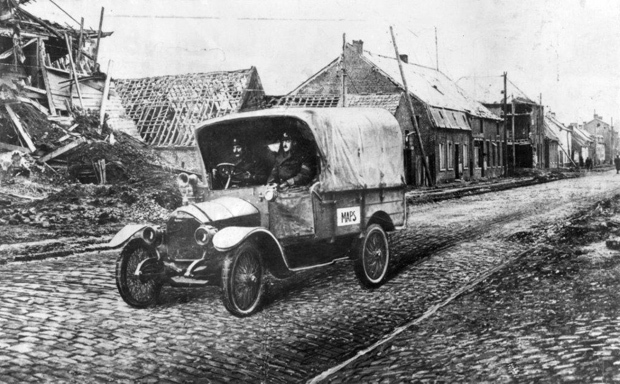 The effects of the work of today’s Ordnance Survey, a self-funding civilian government department, may not be as obviously urgent, but as a contributor to wider society, business and, yes, leisure, its contribution to the Britain of today is as vital to our peacetime interests as it was on the Western Front. 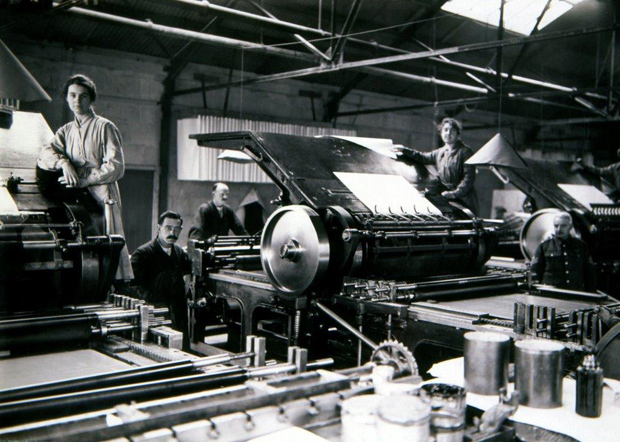 More information about Ordnance Survey's history is available on their history pages. A well writen and interesting article on a little known WW1 topic. As with most modern Military History, sources we hear much about the Infantry in the trenches, the Artillery, the mounted troops and the Flying Corps etc. but little about the people/Units that directly supported operations in the field in all theatres which is generally taken for granted. Without taking anything away from the fighting Arms it is however good to see information being published about the Logistical Support etc. Units and personnel particularly given the circumstances under which these surveyors were forced to operate in the field. I was also pleased to see the image of the Map vehicle which I believe is a Shelsley, box car out of the Crossley stable. Rod D - author "The Benzine Lancers".